Here's an image of the finished background, more or less. I tortured it by building up layers and taking them back down, and, in return, it tormented me with doubts. In the process of making this piece, I've seen how it could be much simpler, stark and austere. The central image, the doily, is strong enough to carry the piece against a plain background. However, that piece would end up being about something related, but different. Alas! I have the need to see my original idea through and cram more ideas into it! No worries - that's the beauty of alternative versions. In a previous post, I included images of samplers and I think that reference is fairly straightforward. Below are images that are also a source of inspiration to the piece. The first two are examples of psychographs, a form of spirit writing. "Many of the photographs by M. J. Vearncombe of Bridgewater also revealed writings by the spirits. They were mostly "psychographs". 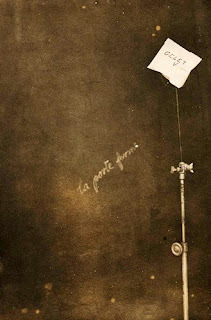 The photographer would "magnetize" photographic plates still in their sealed package, or he would photograph a studio curtain to which envelopes of the packaging from photographic plates had been attached. 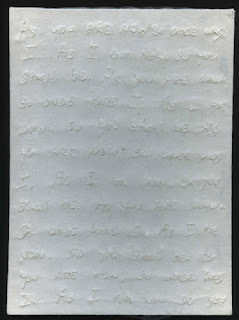 These envelopes or packages generally contained sheets of paper on which séance participants had written questions addressed to the spirits. 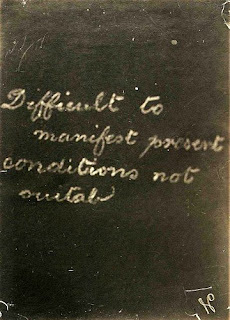 The hope was that the spirits' answer would appear on the photograph when printed. In the two photographs by Vearncombe seen here, it seems that contact with the beyond was difficult to achieve." 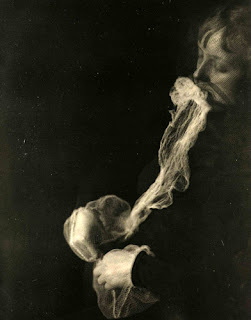 Below is a photograph of a medium materializing an ectoplasmic veil, a milky white substance extruded from the body of a medium during a séance. Ectoplasm could assume the form of faces, limbs or bodies of spirits, and, boys and girls, it came forth from all of the body orifices. "In Munich in late 1912and 1913, Schrenck-Notzing undertook experiments with the medium Stanislawa P. (Popielska), who until then had worked mainly in her native Warsaw. Shrenck-Notzing managed to take a series of photographs which were regarded by many as the most striking images of materialization phenomena ever produced, at least from an aesthetic point of view. ... He was certain the Stanislawa P., whose virginity was attested, would be unable to hide any kind of object either on or inside her body." Gosh, that ectoplasm looks like netting. psst... come closer I wanna tell you a secret... I don't believe in ghosts. Don't tell anyone. And don't forget Ezra Pound's poem, A Virginal - I haven't been able to forget the last line for more than 20 years. As white their bark, so white this lady's hours.